Sometimes people create modest personal oases in Second Life—just tiny little spots with charm and grace. Such is the case with The Farmhouse. 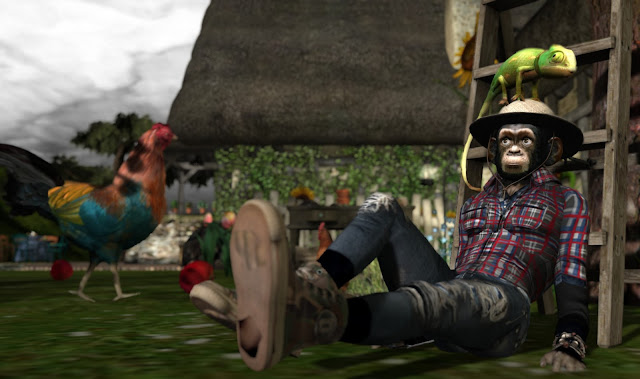 A couple weeks ago, my friend Naxos Loon dropped me a landmark to this place (he's pictured below, relaxing against a ladder with an iguana on his head (this, if you don't know Nax, is entirely normal), which turned out to be a creation by our mutual friend and photographer Wind (a.k.a. WhoFliesWithTheWind Writer). It is, as its name suggests, simply a farmhouse, surrounded by an assortment of crops happily growing in a nearby garden, plus an assortment of animals, ranging from feathered foul to a donkey. Chirping birds abound. For now, Wind plans to keep the space open to the public, but she might close it at some point in the future, so do stop by to enjoy it just in case. Thanks, Wind, and thanks for sharing your place with everyone!